I love trying new food when I am out and about. Near my work on a Thursday there is a world food market with Spanish Paellas, German Sausages, Asian dumpling stands, Indonesian Nasi goreng and more. 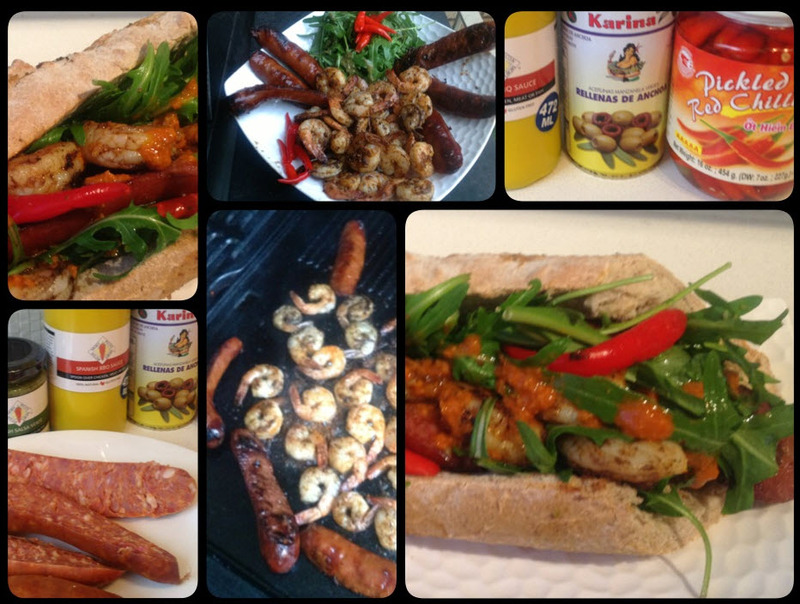 One of my favourites is the BBQ Prawn and Chorizo rolls. As you walk past you can smell the prawns and Chorizo on the BBQ mixed with Garlic and it is pretty hard to resist! I purchased one for $5.50 and was not disappointed, although I did decide If I was to make these myself I would definitely put more of the good stuff in my bread roll.. less bread, more prawn and chorizo. If you like a little heat you can add Jalapenos or pickled chilli. Or just make your own at home. I have added home made pesto to these rolls previously also, very yummy! This is a delicious dish that is easy but exotic and a little fancy to serve when friends drop by, or as I enjoyed last Friday night at home with a beer after work with my fiancé! BBQ 4 Chorizos cut in half lengthways for 10 minutes adding the 28 peeled prawns for the last 4 minutes in my Garlic and paprika sauce. Once cooked through serve on a platter with rocket and sides of jalapenos, chopped olives, chilli and pesto with some crusty bread rolls. Guests can build their own rolls to their liking with the food on the platter, serves 4. I will be serving this at my engagement party to jazz up the casual BBQ we will be having, cant wait for people to try this dish!